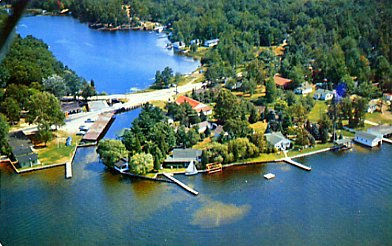 Waterside Resort is located on beautiful Hamlin Lake. 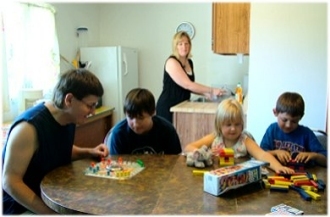 Here you will find our clean and comfortable cottages and apartment for rent, featuring all the modern amenities. Waterside’s 5 Lakeside cottages are right on the lake and South Bayou and are in close proximity to the private sandy beach and kid’s play area. Along with the waterside cottages we have 2 “pet friendly” cottages, each with a private fenced in yard for the pets. Prior approval from owner is required for “pet friendly” cottages. Both of these cottages have a grassy yard and play area for the kids. 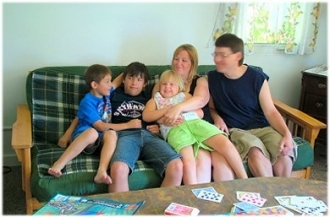 Waterside Resort can accommodate the larger groups too, our Lakeview Apartment has lodging for up to 10 guests. This apartment is just a few steps away from the large shaded grassy yard and fire pit. Forget something . . . . . Waterside Store is just around the corner for your convenience. We carry a variety of items including snacks, beverages, licenses, rentals, unleaded and pre-mix gasoline non-ethanol 90 octane, and so much more. Or just stop by for some ice cream, snacks, fishing accessories and conversation. We are open daily till 7:00pm, give us a call at (231) 843-2090 for more information. Looking for some great fun on Hamlin Lake? 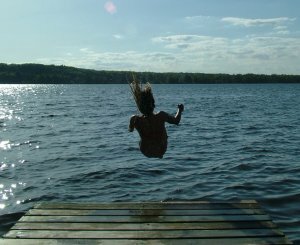 You can't spend time at the lake without getting into the water. 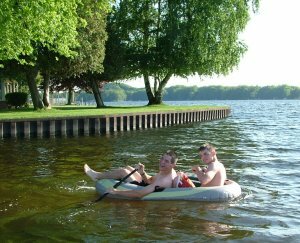 Come to Waterside Resort and Boat Rental and rent a pontoon boat, fishing boat or kayak. Access to swimming area and boat slips are just a few steps from your door. Don’t let the fun stop there. Waterside Resort is close to all the recreational and sight-seeing opportunities in the Ludington Area. Visit the Ludington Area for shopping, dining, and entertainment. Take walks on the beach and look out at beautiful Lake Michigan, watch the SS Badger set sail and experience all that Ludington has to offer. Make Waterside Resort your vacation destination!